PMU pays out mega euro1962.80 for 1 euro forecast on Racing day for the lucky Punters at Deauville la Touques race course Tuesday 11th August 2015. Deauville La Touques races Tuesday 11th August Mega win day for the lucky punters on the PMU as long odds raced in ..After a heavy downfall of rain all night, cooling the air. Smaller crowd after Sunday’s 10.000+ visitors during the LARC Latin American sponsored races & Tango dancers . Prix de la Falaise paid out euro 189 on a 1euro PMU forecast 3-8. No.3 PLEASEMETOO RIDDEN by jockey G.Benoist,trained by D.Smaga. No.8 DOUBLEDREAM, ridden by C.Demuro. In the later Prix L’Ane a Theme the PMU paid out euro 137.40 on a 1 euro PMU Forecast. No.7 Machica ridden by jockey, J.Plateaux, & trained by Detcher,Sanchez. No.9 Filly Green. ridden by A.Badel. & trained by F.Chappel. In the PRIX D’EQUEMAUVILLE the savvy forecasters won big time. 1 euro PMU BET FORECAST “COUPLE ORDRE” WON EURO 613.60. & THE “TRIO” FORECAST PMU 1EURO WON Euro 1962.80. Horses now. 18-14-8. DESTINY HIGHWAY RIDDEN BY JOCKEY A.MOREAU. STAR D’AUTHIE RIDDEN BY ITALIAN CRACK JOCKEY U.RUSPOLI. & FINALLY No.8 RIDDEN BY FRENCH CHAMPION JOCKEY C.SOUMILLON. Famous French trainer Andre Fabre trained the winning Favourite LORD OF THE LAND, owned by the German Gestut Ammerland, . 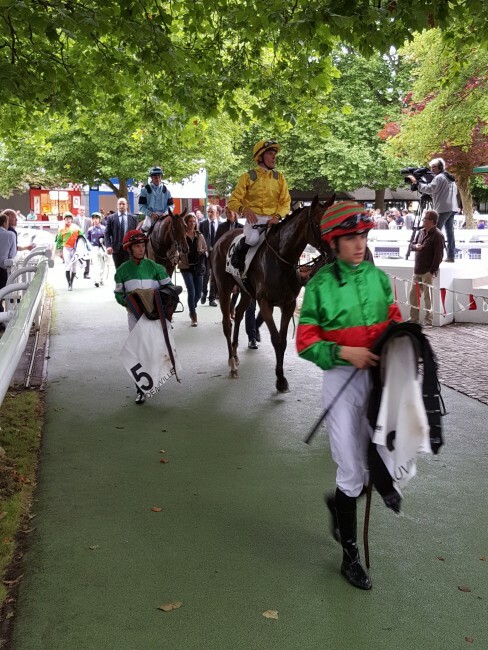 in the PRIX COLOMBELLES, ridden by jockey PC Boudot.Deauville La Touques racing organised by France Galop.